I’m very excited to have been invited to be a guest judge over at Viewing Clutter for George Ivanoff’s latest competition. 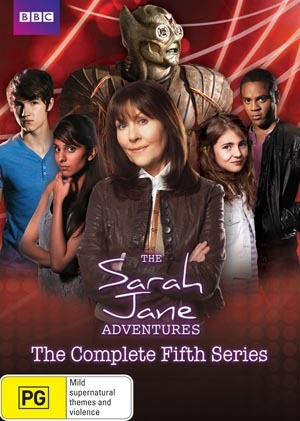 For your chance to win DVD copies of The Sarah Jane Adventures: The Complete Fifth Series head on over. It’s such a great prize I almost wish I wasn’t a judge, just so I could enter! This entry was posted in Geek, Pop Culture, TV and tagged Doctor Who, George Ivanoff, Sarah Jane Smith on July 30, 2012 by David. I haven’t been following you for long and kind of came upon your blog. Well done to you on being a judge that is trully impressive! Wish I had the guts to enter. I’d encourage you to enter – it’s a blind judging so no need to be shy! Thanks for getting back to me! this is probably a silly question but is it just a one word answer.. it wasn’t very clear from the post? Screwdriver is one, screw driver is two (bad examples but I didn’t want to pick an example someone might use!). Haha I don’t mind them either!